Place a rack in the bottom of a large stock pot. Fill pot with hot water. Sterilize 7 1-quart canning jars, 7 lids, and 7 rings by placing on rack, jars upright. Bring water to a boil. Boil 10 minutes. Remove with a holder and allow jars to air-dry. Save water for processing apples. Combine sugar, cornstarch, cinnamon, nutmeg, salt, and water in a large saucepan. Place over high heat and cook until thick and bubbly, stirring frequently. Remove from heat and stir in lemon juice. 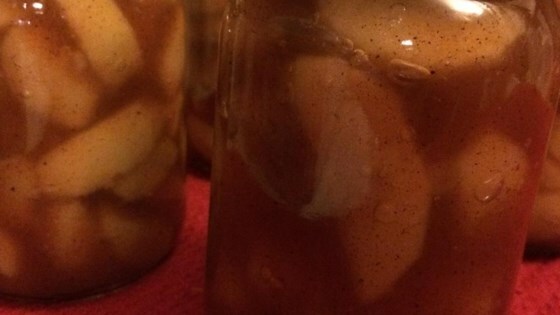 Tightly pack apples into sterilized jars. Slowly pour syrup over apples, covering them completely. Gently tap jars on countertop to allow air bubbles to rise. Screw lids on jars. Carefully lower jars into pot using a holder. Leave a 2 inch space between jars. Add more boiling water if necessary, until tops of jars are covered by 2 inches of water. Bring water to a full boil, then cover and process for 30 minutes. Remove jars from pot and place on cloth-covered or wood surface, several inches apart, until cool. Once cool, press top of each lid with finger, ensuring that seal is tight (lid doesn't move up or down at all). Sealed jars can be stored for up to a year. Awesome !! This is so good. Good over ice cream pancakes waffles or french toast. This is so good to just eat out of the Jar.. Add to your pancake batter very good we eat them out camping .. I love this recipe! It is very easy and sooooo tasty. My sister and I made 36 jars yesterday for christmas gifts, and we are already planning on doing it again next year. Great recipe..great jar idea! LOVE IT!!! loved it. filled up 6 jars and is great over icecream. good on anything really. I just finished making this - it tastes so good!! I made it exactly as suggested. I thought the flavor was very tasty!! I can't wait to make more!